So a few months ago myself and my friend Kate made some exciting plans to go away and work for the summer. It was originally supposed to be Canada but when that didn’t work out we changed our minds and decided on Berlin. 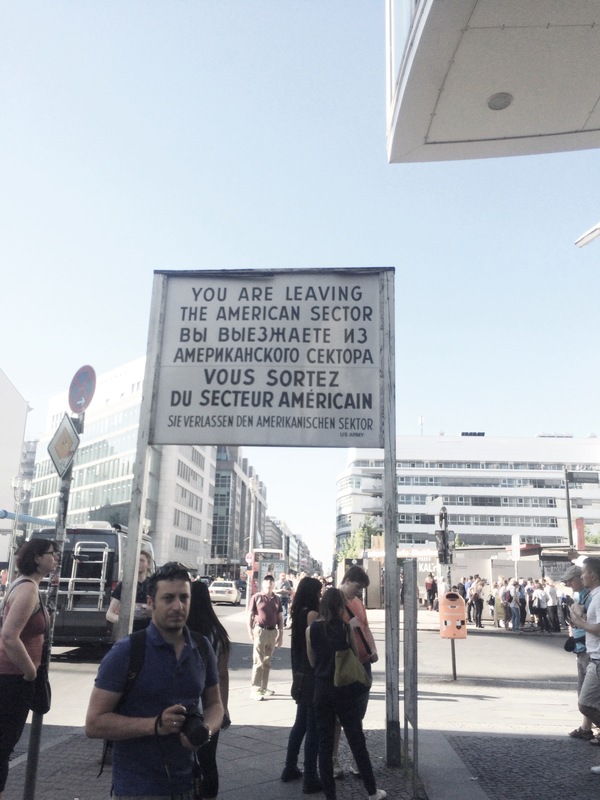 Now I knew going to Berlin for the summer to work was going to be ultimately harder than elsewhere because of the language barrier but I felt confident that I could manage to find my way around it and get some work and not have too much trouble. In my first week here I have found that is NOT the case. Everyone has told me that the people of Berlin are friendly and welcoming and while that has been the general experience I have experienced too much rudeness in the span of five days than a person should in a scary new city. Whenever I have had a tourist come to me at home in Dublin with broken English or even asking me if I speak English in search of help I have always been polite, welcoming and friendly but I have encountered too many people rolling their eyes, looking annoyed and generally not treating us too nicely all because we are not German. The lack of a job is making me nervous, I have already been joking about changing my flight home which is silly because this was supposed to be my summer of fun while working and exploring a new city, but if I can’t find a job before my money runs out I’ll need to fly home because I’m pretty sure I could find work more easily in Dublin where there is no work at all because of the recession compared to here. Hopefully it doesn’t come to that, me flying home, but having no job lined up and not speaking German really makes my anxiety skyrocket and that’s not a great feeling. Other than that, exploring the city has been really great. The public transport system they have is really easy to navigate and the trains are very frequent, the hot weather makes them a bit sweaty but that’s something you can’t really avoid and I don’t mind it that much. 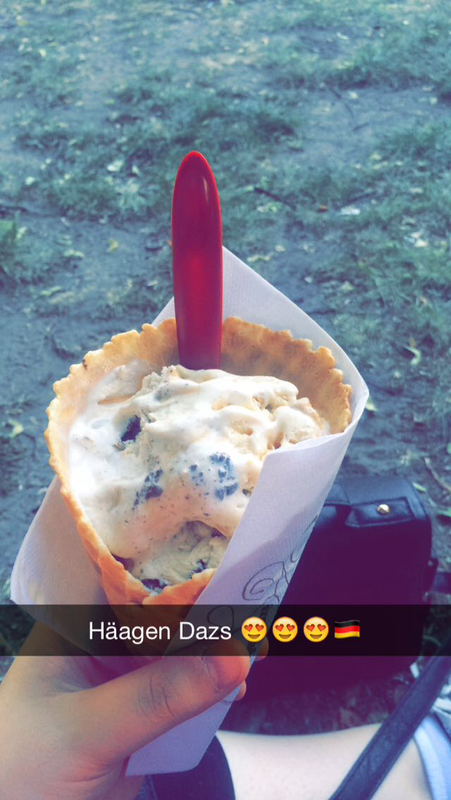 Plus the Häagen Dazs treats make it all the more rewarding the be out in the heat! Everything seems reasonably priced so it would be a city I would definitely recommend for a little city break, I have managed a week with no German so it would definitely be possible for a tourist to navigate, I just don’t know if I can manage a summer without German! We ventured out to Hackescher Markt to find a seat to watch the Champions League final, while I had no affiliation to either team I leaned towards Barcelona, lucky us we were surrounded by Juventus fans. Not long into the game two Italian guys asked if they could sit at our table, the only free seats left. We said yes not thinking anything of it, but did we regret it. They were loud, obnoxious and rude to everyone around us, I know footballs fans are loud while watching games but this went beyond normal, they ordered beers and food, pestered the wait staff and then once the first half was over and their food was finished, they actually tried to leave without paying. We couldn’t believe it and were mortified when waiters and bouncers were chasing after these two men, hoping no one thought we were with them. To cap off the end of our first week here, with most things closed on a Sunday we went to a little corner shop that opens, got some German beer (which I for some reason actually enjoy, having never liked beer before) and went for a stroll before finding a seat by the river, the weather was mild and the company was better. While I am nervous about finding a job here, I know that if worst comes to worst, I can just go home, it won’t be the end of the world.